LL: Amy, can you describe where you come from? AM: I come from California, in Sonoma which is north of SanFransisco, it's wine country with vineyards and good food. I am a connoisseur of food, the biggest wine makers there are Kendall Jackson and Korbel the champagne. There’s a rivalry between Napa (Valley) and Sonoma, there’s a bumper sticker that says, “Napa makes auto parts and Sonoma makes wine.” I also love Truckee, Ca, my parents have a cabin there, at the north of Tahoe. LL: What’s your impression of Tacloban? AM: I was amazed by how warm and welcoming this culture is. I was shocked when I arrived here at first with the tent city. I didn’t understand the gravity of Yolanda before coming over, just seeing the people 6 months after the disaster and still living in tents, that impacted me. I was in Bohol since Febuary 2013, I remember being struck by the street signs that said “need food.” When I got here, it was worse. We were doing deconstruction in Bohol but then I saw in Anibong some people were living inside the ships, rebuilding their homes among the debris. They did warn us that we could find bodies when we began rebuilding (the community). AM: Growing up in Hong Kong, I would travel to different places. I remember seeing poverty being a child, so I wanted to help people that needed help. With volunteering, the biggest fear for me was the “unknown,” but once I took the first step, I went for it, I had a 2-month vacation from work and I was going to be here as a volunteer for 6 weeks, but during the 4th week I sent my resignation from my work and decided to stay longer. I had volunteered for 11 months and I am now an aid worker, a field coordinator with All Hands. LL: Why did you choose to volunteer in our place? AM: I had been following All Hands for 5 years already. When the news about Typhoon Haiyan came, I saw on television, I sent an application to All Hands and they gave me preference whether to volunteer in Bohol or Leyte so I went to Bohol, the project was finished by June 30th and they asked us of we would come to Leyte, so I came along with 15 other volunteers. AM: Yes, I often wonder how I will adjust back because I have been living here for 20 months now. I have only bought a shirt and a pair of shorts, this shorts I am wearing is a hand me down. I’ve become very appreciative, when I went back to the US last July, I saw the material things that everyone has and I thought it wasn't necessary. One thing I find, along with all the people I volunteer with - we are humbled by the people here who are resilient, positive, have a smile and they mean it. It’s sweet, it makes me appreciative of things, it’s inspiring to me. And when people at home says to me. “Oh what you are doing is selfless," I feel they don’t understand; it feels like I am not doing a lot really. A couple of things I do for the new volunteers who did not see this place when it was bad here is I orient them on how it was and show them how resilient this community is. AM: I think I would say I am an advocate. LL: Given all that has happened in the world, the news we see, the political and religious wars between countries, there’s terrorism and the natural disasters which we cannot control. Do you feel there is hope for the future of our planet? AM: I know that there are so many horrific things that are happening (in the world) and that’s why I decided to stay here so that I can help. With what little I can do I hope there is a ripple effect of good that comes out of it and I hope it will become bigger. LL: Of course, we must never underestimate the power of one. In connection with this, given an opportunity to resolve one disaster or conflict going on in the world right now, which one would you take a gander at? AM: Before working with All Hands I was monitoring the water problem of the world closely, 1 billion people are affected by the lack of good water. Women and children are affected, some kids who are not able to go to school because they have to walk for 4 hours to fetch water and it’s not even drinkable water at that. This organization called Charity Water (set up by Scott Harrison), I saw him speak, he's set up where your donation goes directly to digging for wells, there’s transparency in the reports and he mentioned that not a lot of people donate to this cause. AM: My 7 nieces and nephews, spending time with them, whether playing with them at the beach, camping, just spending time time with w/ them. LL: What’s next for you Amy? AM: I actually will take a break, I am going home for Christmas, you know, my mom turned 75 in July of this year, I surprised her by going there, not letting them know I was going. Now it’s my father’s birthday, I think when I am there I’ll know a little bit more about whether we will extend our work here, I know we have a project in Nepal, and another one in Malawi, but I don’t know if that project will still be there. I love living in a community, I would love to travel the Southeast Asian countries, Cambodia, Laos, Vietnam, Myanmar, I visited Thailand last year. LL: I have 7 one-word-answer questions I want to ask you, you must choose one answer between the choices and you are not allowed to explain why. Shall we have a go at it? 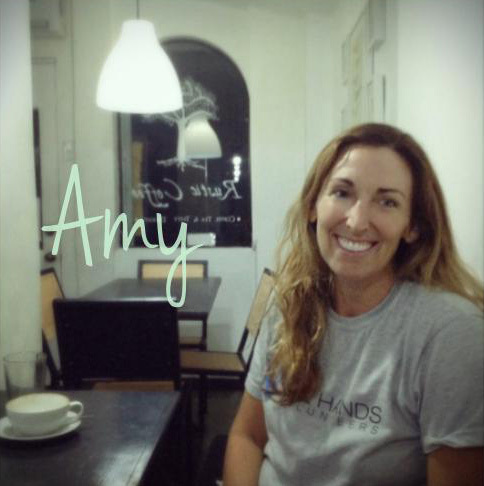 As I conclude my interview with Amy, I am amazed by her, she is indefatigable. She’s been here for 20 months now and has remained committed the whole time. I mention to her that many people would have already up and left and relinquished the duties. But despite the challenges of not having a comfortable bed to sleep at night, a decent shower, proper laundry, the food she's been used to, she’s still here and is determined to see all these through. Amy takes it all in stride. How is it that for everything that she’s done, she still remains humbled. Perhaps this is what the real thing is made of. Amy, we are very honored for all you’ve done. From all of us: thank you. Wonderful profile on Amy. Bless her heart and all those volunteers for all they've done and continue to do. They are blessings to our community more than they will realize.